It was our 'date day' as opposed to a 'date night' on one of our occasional trips to Phoenix. The grandparents were spending quality time with our son and the hubby and I spent the afternoon together. We picked Scottsdale as our chosen location so I did a search of nearby restaurants on my trusty Yelp app and came up with Tommy V's Urban Kitchen and Bar in downtown Scottsdale. Tommy V's looked fancy from the outside and even fancier and inviting, in the inside. Their cuisine is Italian with a twist. Did I mention that happy hour starts at 11:00am? Wow! The happy hour food menu had a lot of choices and for *very* reasonable prices; certainly not prices we would see in San Diego! We both started off with a Caesar salad [$5.50 - no picture]. It was crisp, fresh and very yummy. The croutons were homemade and the shaved parmesan was a plus to give it that usual extra bite of saltiness. 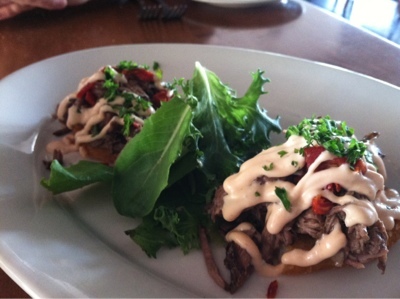 We ordered the Kobe beef stacks [$6.50], which were shaved Kobe beef on crispy potato pancakes and drizzled with a spicy remoulade sauce. Each stack was topped with roasted red pepper and chopped parsley. The flavors were absolutely delicious together. The Kobe beef melted in my mouth. 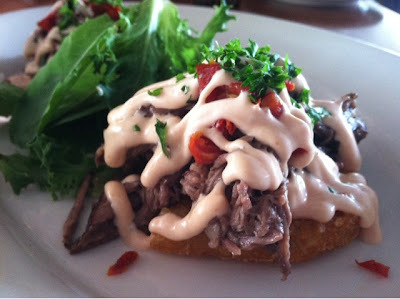 The crunchy potato, juicy beef, spicy sauce and the bitter greens were yummy in my tummy. 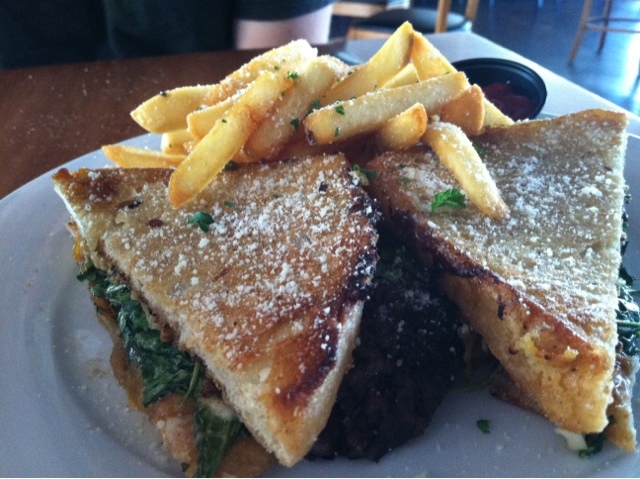 The hubby ordered the grilled cheese and short rib sandwich [$10.00]. Need I say more? Salty, delicious, and full of flavor. The sandwich had melted Manchego and cheddar cheeses, arugula, braised short rib and caramelized onions. My dish was amazing. 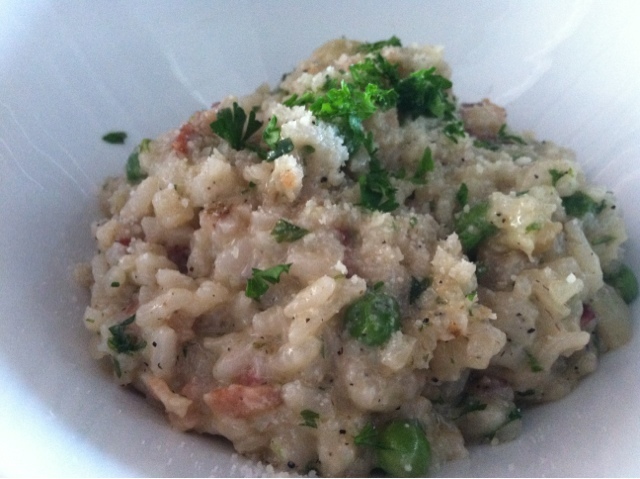 I ordered the risotto carbonara [$8.00]. Anything "carbonara" has the ingredients of pancetta (cured, not smoked) pork that resembles bacon, sweet peas, egg, and parmesan cheese. The risotto did not spread out like a traditional risotto would, but... I didn't care. It was SO good that even though I was already full from the salad and beef stack, I ate the whole thing. 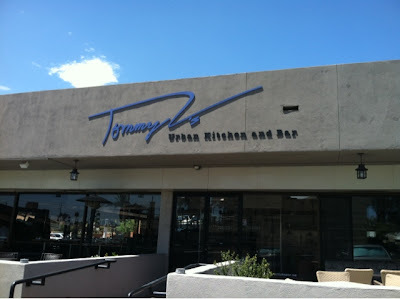 There is a Tommy V's Urban Kitchen and Bar in Carlsbad, but I am not positive that there are the same family of restaurants since their logos and menus are completely different. I still can't believe the bowl of risotto carbonara was only $8. We will certainly visit again, just for that reason!